As Sri Lankans (most proper ‘rice addicts’ by birthright) we are constantly on the lookout for a tempting plate of rice and curry come lunchtime. Though you’re never short of options, you’d often find most of the so-called ‘bath kades’ putting up the same old tired dishes on a daily basis. With the launch of its newest ‘Regional home-style Sri Lankan lunch menu’, the rooftop bistro and bar Botanik looks to fill the void in this popular cuisine. We were invited to an official tasting at the bistro, located along Hospital Street Colombo 1, to experience the menu that features dishes and curries not usually found in restaurants. The spread before us included a choice of three mains. These included a Lemongrass Chicken Curry, Fish Fry (Badum), Beef Stew and a Jakfruit curry. All of them were accompanied with Ghee Keera Samba Rice, four vegetable curries, sambals and house condiments. We helped ourselves to the Beef Stew first. Slow cooked overnight (for eight hours approx), this allows the meat to tenderize so that it melts in your mouth at the first bite. The cooking process also ensures the meat comes packed with a range of flavours, including tamarind, chillies and lime. Lemongrass is a tricky ingredient which could end up overpowering the dish if it’s not balanced well, but this was not the case with their chicken curry. The chicken remained the hero of the dish throughout the entire course, though with a distinct hit of lemongrass flavour. 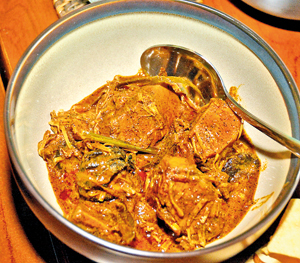 The Jakfruit curry was also slow cooked, packing in a range of complex flavours that could only be achieved by this cooking method. This dish is the perfect option for any vegetarian diner. The balance of spices and flavours in the curries paired well with the authentic ghee rice, beetroot curry, dhal, tempered potatoes (Ala thel daala) and aubergine curry. 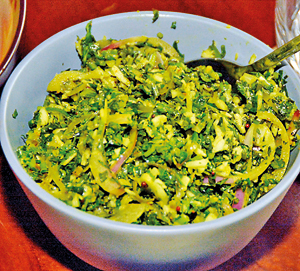 The cabbage leaf salad (mallung) that was also served added freshness to the plate, while the pickle brought in much needed acidity and the pappadum some crunch. In a nutshell, this was a plate of rice and curry with a modern twist. Head Chef Nizran Yazid tells us the recipes are from his home style of cooking. Beef is a staple in Chef Nizran’s household and he developed this style of slow-cooking the meat over time as he was exposed to the culinary industry. 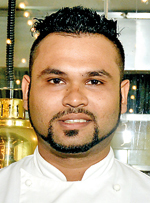 The menu was developed by him and Head Chef Nandana Wanigasekera. Overall, the bistro is the perfect place if you’re looking to take a foreign client for a business lunch and offer a taste of Lankan food, or simply want to enjoy your lunch break (or as we would put it, a cocktail break) away from the scorching sun.